A radically better way to serve hotels at 0% commission. 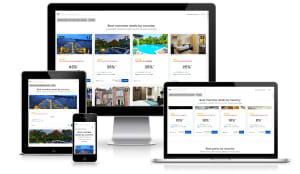 Traveliko.com offers the cheapest distribution channel for hotels to sell their room online and compete with other OTAs, we aim at rebalancing the online distribution landscape. As we simply charge no commission, we encourage hotels to extend our users an extra “Members Discount” in order to compete with other OTAs while maintaining rate parity integrity. We don’t charge you any commission. Selling your room on Traveliko is FREE. As we charge no commission we encourage you to offer our user an extra discount to incentivize them the use our channel. Traveliko.com do not own your customers. With every booking you receive your customer contact details. With our package and add-ons feature* you can capture guest at a higher price point. Create as many campaign as you want, target specific market, city, time zone, IP address and more. Here again you activate your campaign as you wish. Our CMS let you add your meeting rooms, spa, restaurants and more so you can showcase your product to its best. You sell the number of rooms you want. We do not impose you allotment. We have nothing to gain as we don’t charge you a commission. We don’t compete against your hotel name with google AdWords.